Firstly, they possess a hydrophilic (water loving) exterior, promoting water solubility, and a hydrophobic (water repelling and lipid loving) interior that can accommodate small lipophilic (fatty) molecules. Secondly, CDs cannot be degraded by human body and will be excreted, in intact form via the kidney, after intravenous administration. Importantly, because of this property, CDs are inert and generally recognized as safe (GRAS). 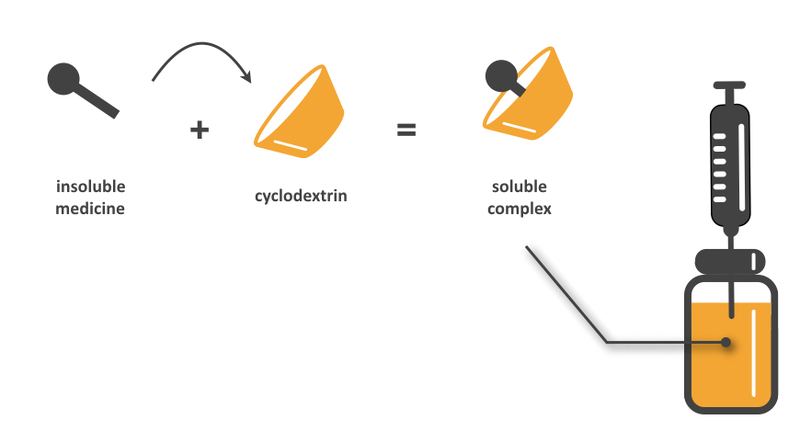 As such, CDs are currently mainly used as pharmaceutical excipients (inactive vehicles) that can solubilize various poorly soluble drugs through the formation of water-soluble drug-CD complexes. Nowadays, several dozens of drug-CD complexes are registered and marketed.